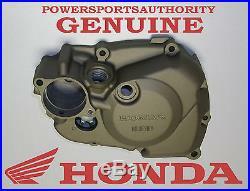 Genuine HONDA OEM Left Engine Cover Part Number: 11340-MEN-850 Is your cover cracked or damaged? Replace it with a genuine OEM HONDA Left Engine Cover. Please contact with any questions. Return for any reason if not satisfied. The item "2004-2008 HONDA CRF 450R OEM Left Side Engine Crank Case Cover 11340-MEN-850" is in sale since Thursday, February 12, 2015. This item is in the category "eBay Motors\Parts & Accessories\Motorcycle Parts\Engines & Engine Parts\Other Engines & Engine Parts". The seller is "powersportsauthority" and is located in West Plains, Missouri.